Burning Man's reputation for bacchanalian revelry is well deserved. The festival is one of the planet's biggest parties, famously crescendoing in the immolation of a towering wooden stick figure on Saturday night, accompanied by a chaotic, high-firepower pyrotechnics display that, unlike most fireworks shows, feels all grand finale, all of the time. Traditional Fourth of July shows go pop … pop … pop on a slow build to a short-lived frenzy. By contrast, when the Man burns, it's frenzy from the instant of ignition ? and when he finally collapses into an immense, searing orange mass, a whole new frenzy begins, as audience members leap to their feet and rush toward the flames, running, circling, dancing, laughing, shielding their faces from the heat even as they push ever closer to it. The entire weeklong event is noise, heat, dust, lights, chaos, color, cacophony. With the sole exception of the Temple. This too is built to be burned, on the final night of the event. The structure's design differs from year to year ? 2013's Temple was pyramid-shaped; previous years' Temples have evoked Asian or European architecture ? but the feeling is always the same. It's the only place in all of Black Rock City, population 68,000, where there is intentional silence. The thumping bass from DJs who spin around the clock, the random shouts and catcalls, the music, silliness and laughter seem far away here. This is the place Burners come to mourn their dead. When the Temple is lit afire on Sunday night, after half the revelers have already packed up and headed for home, this fire too will be immense. But it's watched in hushed reverence, its flames casting a glow on tear-streaked faces. The Temple is an oasis of sadness in the relentless desert merriment. Punctuated by softly echoing gongs that only gradually come into the visitor's awareness, the silence here is unifying, an unspoken agreement among all present, among everyone who has ever experienced the pain of loss. Tucked into the beveled wood partitions and tacked onto the wooden walls are tokens of remembrance: photos, letters, collages, books, pieces of jewelry, smooth stones. There are Sharpies here, too, for scrawling messages. One says, "We miss you Taylor." Another says, "Grandma, you would have loved this." Though few words are spoken, there is an air of understanding around the Temple, because most are here for the same reason: to grieve. Late on Thursday afternoon of this year's fest, as the fierce Nevada sun had begun its descent toward the mountains and the winds, mostly calm to that point, began to whip up the week's first dust storm, those gathered at the Temple looked up to the sound of sirens. Lifting bandannas to their faces, sliding goggles over their eyes to look through the murky, dust-swirled air, the scattered crowd began to thicken around the Temple's entrance, craning their necks to see a line of about 30 Bureau of Land Management vehicles slowly rolling toward the Temple. Prior to this year's event, rumors that there would be an unprecedented law enforcement crackdown were pervasive. The San Francisco Chronicle was reporting that participants could expect to get dinged even for minor infractions. Boing Boing's widely disseminated pre-event story quoted one worker on the build crew who warned, "The pigs are here. And uncommonly badge-heavy. 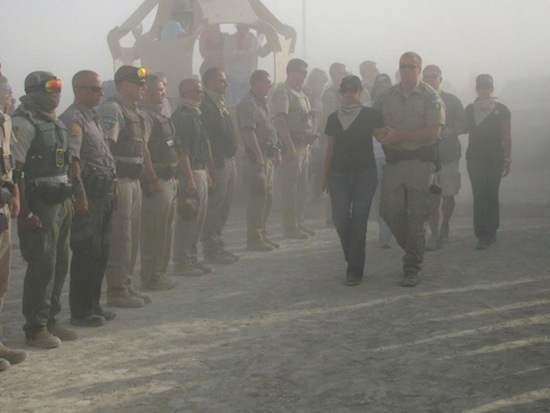 … In 18 years on the playa, I've never seen a more aggressive police presence than what's been going down today. Deeply upsetting, outrageous stuff." The Bureau of Land Management SUVs approached the Temple with red lights spinning. Most of the vehicles had their dark-tinted windows rolled up. They looked inaccessible, intimidating. The vehicles came to a stop near the Temple's gates, and about 50 officers exited, forming a double line flanking either side of the path leading inside. Some removed their hats. One called out, "Atten-hut!" and the line of rangers snapped to attention. The militaristic procedure made the rangers seem, for a moment, even more out of place. Then, a slender, 30-something woman emerged from the lead vehicle, dressed simply in jeans and a black T-shirt. She leaned heavily on the arm of a BLM special agent. In her free hand, she clutched a tissue. As the rangers and the crowd stood parted, she walked slowly inside the Temple. Her name was Kelly Reynolds, and she was the widow of BLM Special Agent Michael Dwayne Bolinger, who died of a brain tumor in June. She had come to the Temple to place a plaque in his honor. Bolinger, who had served multiple years on duty at Burning Man, loved the event. He was a UC Berkeley graduate, Reynolds explained, and although he attended in his capacity as a law enforcement officer, he had a deep and abiding appreciation for the festival. At the moment Reynolds emerged, everyone understood. This was not a show of force but a show of support. The officers were there to honor one of their own ? and to do so by participating in a Burning Man tradition. As that comprehension filtered through the crowd, so did a sense of unity. Gone was the uneasy sense of us versus them, of counterculture versus law enforcement. At that moment, everyone present was simply human. After placing the plaque atop a glossy black stone sculpture at the center of the Temple, a close friend and colleague briefly spoke about Bolinger, closing his remarks by saying, "Thank you for your show of respect to Kelly, and to all of us. And if you have a chance to meet one of the law enforcement officers that's working out here, go over and introduce yourself, and if you're so moved, express your appreciation for what they do out here so you can have a safe, fun event." Immediately, a voice in the crowd shouted, "Thank you for your service!" The normally silent Temple erupted in thunderous applause.